When in 1995 the remains of the French-Polish scientist Marie Curie (7 November 1867 – 4 July 1934) were exhumed from the Sceaux cemetery to be transferred to the Pantheon in Paris, it was feared that they would emit harmful levels of radiation, such as still occurs today with her laboratory notebooks. But there was no radium in the remains, which suggested that the disease that killed the researcher was not due to the radioactive elements that she handled, but rather to an excessive exposure to X-rays caused by her unusual invention: the mobile radiology machine that she took to the battlefields during the First World War. 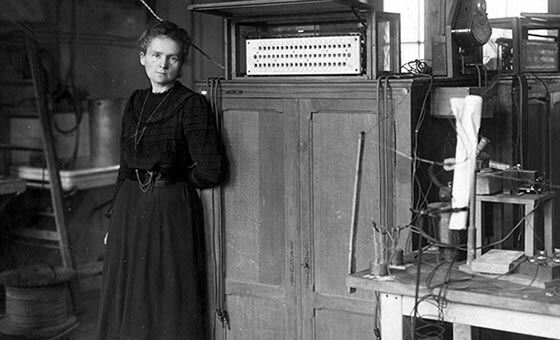 The achievements of Curie and her husband Pierre, who died in 1906, are well known. The discovery of radium and polonium allowed us to define the properties of radioactivity, a term coined by the researcher herself. The finding that elements such as uranium emitted radiation was joined in the same period with the discovery of the electron, which proved that the atom was not indivisible as was believed. For all this Marie Curie received not one Nobel Prize, but two, being the first person to achieve this and the only one who has ever done so in two different scientific disciplines—physics and chemistry. Less well known, though equally well documented, is Curie’s work during the First World War, inspired by her humanitarian spirit and devotion to her host country. 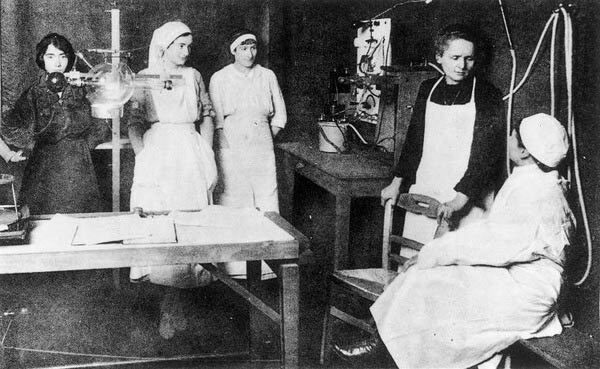 With the outbreak of conflict and the threat of a German invasion looming over Paris, daily life was suspended, including Curie’s research. The French government moved to Bordeaux, where the scientist also brought her most precious treasured, a gram of radium in a lead-lined container, which she left in a safety deposit box at a local bank. But unlike others, Curie did not seek refuge in Bordeaux, but decided to return to Paris. Eager to contribute to the war effort, she bought war bonds and wanted to donate to the government the gold medals from her two Nobel prizes, a gift that was not accepted. Instead, she chose to put her science at the service of the French army. 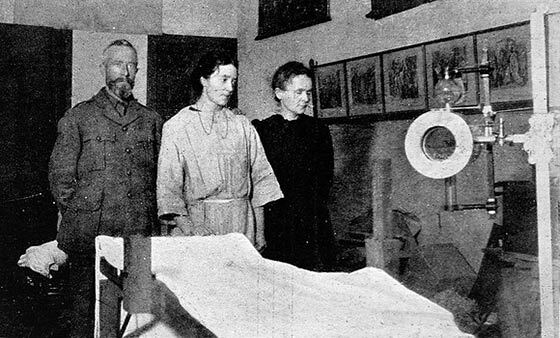 Curie knew that reaction time was critical to treating wounded troops on the battlefield, but military doctors were forced to work with meagre resources. In particular, X-rays had become an enormously useful tool for surgeons since their discovery by Wilhelm Röntgen in 1895, but the machines were only available in large hospitals. Curie set out to bring radiology to the front lines in cars that housed portable X-ray machines. Despite all the difficulties, Curie managed to equip her first car, converted into a truck. As explained to OpenMind by Timothy J. Jorgensen, Radiation Biology Specialist at Georgetown University (USA) and author of Strange Glow: The Story of Radiation (Princeton University Press, 2016), “the portable X-ray machines that Curie used in her cars were actually invented by a Spaniard, Mónico Sánchez Moreno. She produced the X-rays from Crookes tubes, which require a source of electricity.” For this, Curie connected a dynamo to the petroleum-powered engine of the vehicle, which also contained photographic material and darkroom equipment to develop the plates. The first truck was prepared to transport the famous scientist herself to the front line at the Battle of Marne (1914). But that was just the beginning. 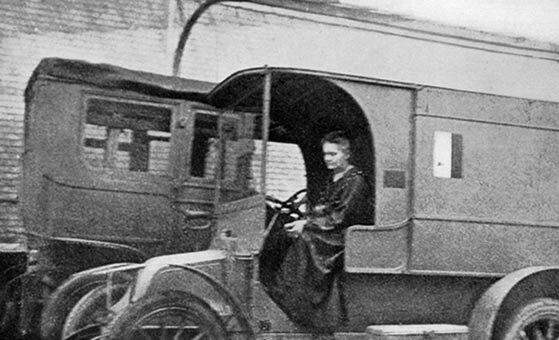 Over time and with the support of wealthy friends, Curie was able to equip 20 vehicles and to train, with the help of her daughter Irene, 150 female volunteers who were put in charge of operating these mobile units. It is estimated that the fleet of trucks, which soon became known as Petites Curies (Little Curies), as well as the 200 fixed radiology units that the scientist distributed to field hospitals, allowed more than one million wounded soldiers to be treated. And yet, as Pasachoff points out, at the end of the war the French government officially recognized the contribution of her daughter Irene, but not that of Marie herself. The historian suggests that perhaps her country of adoption had not yet forgiven the scandal that Curie generated in 1911 when she entered into a love affair with a married man, the physicist Paul Langevin, a former student of Pierre Curie. But it seems that Curie was not particularly interested in awards. In fact, years later she rejected the Order of the Legion of Honour, as her husband had done earlier. She never wanted to leave any medals behind; instead, from her Radium Institute she dedicated the rest of her life to developing her legacy for humanity, a therapy that today continues to save lives. “Radiotherapy has saved many people from dying of cancer, and for those it cannot save, it has prolonged their life and reduced their pain,” Jorgensen concludes.